Your organization may have tens or even hundreds of news feeds across Facebook, Twitter, YouTube, Flickr, RSS, Pinterest, Vimeo, and so on. For your alumni, finding the specific news they want to follow is hard. The newest version of our app debuts several improvements targeted at getting your users to easily see and follow your social media. Like pigs hunting for truffles, we sniff out (almost) ALL of the social media from your organization (alumni and greek chapters, sports blogs, student clubs, academic departments, and so on) and serve them up in one simple app. 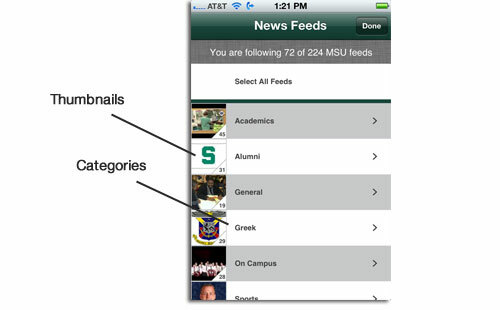 Providing lots of niche news choices is key to building a strong alumni news following. Let’s say you have an alumnus who played soccer, studied history, and belonged to Kappa Delta Something. He or she wants to read news tailored to those interests. 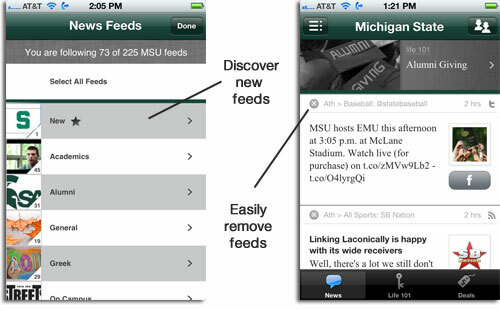 Some organizations have a LOT of feeds (some of our customers have 250+). To make finding those niche interests a little easier, each feed is listed within a useful category such as “Sports” or “Academics”. To make the app fun and engaging, we attach a tiny “thumbnail” image to every news feed to give the user a visual sense of what the feed is all about. As you add (or we find) additional feeds from your organization, these new feeds are highlighted in a “New” category, making discovery of news fun and easy. Also, users can remove feeds (but not your features) by simply tapping on a little “x” next to those stories which they don’t want to read. A fundamental demand exists for your organization’s news. This demand is currently being met by a variety of websites and social media. 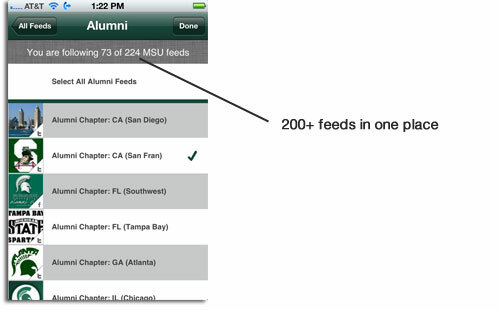 Now your office can satisfy this hunger by offering all this news to your alumni in a beautiful app… branded by you.